There are going to be a lot more seats available for you to fly on this year. And that is spooking investors to climb out of airline stocks. More flights and larger planes can put downward pressure on fares, a basic rule of supply and demand. But airlines seem to looking past that lesson, rushing to add capacity to try to grab market share and take advantage of a strong economy. United Airlines (UAL) announced Tuesday night it would increase capacity between 4% and 6%, faster growth than it had in 2017. It also announced plans to match the fares of some low-fare competitors like Spirit (SAVE) by expanding its no-frills fare options. Thursday Southwest (LUV) announced it would increase capacity by about 5%, also a faster increase than last year. JetBlue (JBLU) expects to grow even more than that. And Alaska Air (ALK) warned it expects to see a decline in revenue it takes in for every mile flown, which could translate into lower fares. The prospect of excess capacity sparking a fare war in the industry has airline investors concerned, and prompted a sharp sell-off in the sector on Wednesday. Industry leader American Airlines (AAL) has the most modest growth plans: a 2.5% increase beyond what it had scheduled in 2017 before it was hit with significant cancellations from numerous hurricanes. In a call with investors Thursday, American CEO Doug Parker pushed back on the idea that these increases in capacity throughout the industry will spark a fare war. "When people hear growth, they think 'Here we go again,'" conceded Parker. "Sometimes, you can get overreactions to a [capacity] number." He said that American isn't changing its plans or financial projections due to all the growth plans announced by competitors. 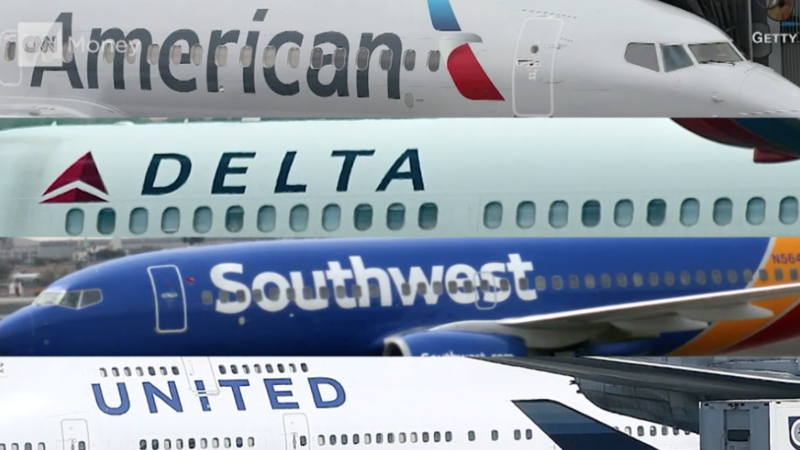 In an interview Thursday on CNBC, Southwest CEO Gary Kelly said he also believes concerns about excess capacity in the airline industry are overblown, and that higher fuel prices is a greater concern for the industry in his view. He said he expects a key measure of fares to increase at Southwest in 2018, "even with this competitive capacity threat." Generally financial conditions are good in the airline industry, despite higher fuel prices. Southwest reported record fourth quarter and full-year profits. And it said that it expects a strong 2018 because the new U.S. tax law should produce "hundreds of millions" of increased earnings this year. Alaska announced a 7% increase in dividends for its shareholders. American reported a drop in earnings Thursday, but said it expects 2018 earnings to rebound. But even with the strong financial results and guidance reported Thursday, airline stocks were off once again in early trading, likely because of the capacity announcements. Related: Is a travel reward card worth it? The increased capacity won't hurt airlines if it's matched by a similar increase in the amount of flying by passengers. The economy is doing well with unemployment at a 17-year low. More people with jobs could lead to more business travel, which is particularly lucrative for the airlines. And it can mean an increase in leisure travel as well.